Last Friday, the 15th of June, the ICD team had the opportunity to speak with H. E. Alberto Correia Neto, Ambassador of Angola in Berlin. 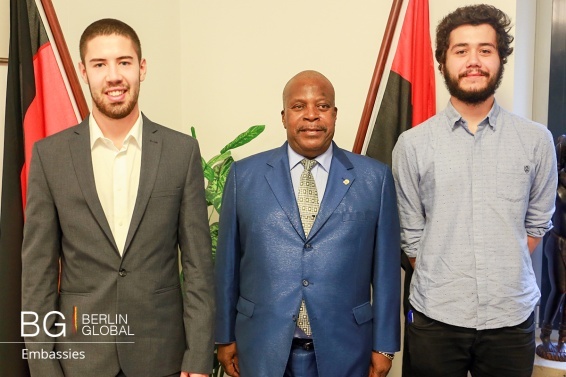 We learned more about the Ambassador’s personal career, his views on relations between Angola and Germany and his take on cultural diplomacy. You have had a very long and diverse career. You have been member of the MPLA both in the secrecy and in power and now, since 2011, the Ambassador of Angola to Germany. From these different positions, which have you found to be the most challenging? I’ve been here since 2011, after a long military career and after living in three different countries as a diplomat: USA, Brazil, Slovakia and now here. I had several challenges throughout my career. In the military, I was faced with the biggest challenges. I started out as a soldier and went through all the different tanks until obtaining the position as a General. That’s why I had the main share of my challenges there. To be precise about what my biggest challenges were is complicated, I can only say that life as a military man it was way harder than as a diplomat. Angola had 14 years of colonial war and then almost 29 years of civil conflict. That means, I come from a country with more than 40 years of war. When the war started out, I was only eleven. I lived my life completely under the shadow of war. That’s why my biggest challenge come from my military career. From your previous experience, did you learn anything there that you always keep in mind, perhaps something from your military career? Yes, it’s true, now as a diplomat I had several experiences. In the USA I was military assistant, then I was an Ambassador in Brazil, then Slovakia and now here in Germany. What impressed me the most was my experience in Brazil. As you know Brazil is a brother-country. it is a country that was, like Angola, colonized by the Portuguese and the people speak Portuguese. It is a country where we have important ties. But what impressed me the most was a phenomenon that from an historical point of view is proving me right. I once gave an interview to a (Brazilian) newspaper and the newspaper said that Angola was one of the most corrupt countries in the world, that we had a dictatorship… Of course, I had to reject those accusations. And the answer I gave wasn’t very appreciated by the Brazilian public. I replied that “the Angolans where fighting to never have the corruption levels existing in Brazil”. And now I know that I was right. It is enough to have a look at what is already happening in Brazil to prove that my theory was correct. That experience was really important. A brother-country accusing you of corruption. it looks like it is the other way round. You have been the Ambassador of Angola to Germany here in Berlin since 2011. How have you enjoyed the position so far and what has been the main focus of your work since you started? My political-diplomatic work here, in Germany, is quite big. As you know, on bilateral cooperation with Germany, Angola is ranked third of the countries of Sub-Saharan Africa, only after South Africa and Nigeria. We want to become the second or the first. This is because we consider Germany to be a well-developed country, technologically, culturally and socially, with a know-how that is positive to Angola’s interests. That is why we think we have to fight to improve the ties between Angola and Germany. There are several areas where we are already cooperating a lot, in the energy domain for example. At this moment, we are trying to effectively electrify our country and the main equipment we are using for that purpose is of German fabrication. Bosch, Siemens… well, equipment that’s helping electrification in our country to become a reality. Aside from that, we are collaborating in other domains. For example, in medicine: almost all our hospitals are furnished by German companies. We have more than 25 enterprises, big and small, which are already cooperating with us in Angola. However, we want even more cooperation. Your Excellency, you have previously worked as the Ambassador of Angola to Eslovakia. How much has your life changed since you moved to Europe? Yes, I liked the experience I had. Each country has its own characteristics. I had a very rich experience in Brazil because it was the first time I held the position of an Ambassador. In Slovakia I also had a really interesting experience, because we were the only African country that had a resident Ambassador in Bratislava. There weren’t any other African Ambassadors in Slovakia; that made it an interesting experience. How have relations between Germany and Angola changed over the years, since you achieved your independence from Portugal? How have those relationships evolved through the years and the different regimes in your country? About that, I will say the following. During colonialism, we didn’t have relations between Angola and Germany. Germany was allied with the Portuguese colonialists, because they were members of NATO. And the weapons used by the Portuguese in the independence war were provided by NATO, most of it fabricated in Germany. But even so, during colonialism, there where progressive organisations in Germany that supported our fight for independence. It’s enough to say that some great members from our party, the MPLA - for example the former Ambassador of Angola in Germany, General Cabulo Bento Ribeiro studied here in Germany, other people like the comrade Lucio Lara, whose wife was German, the Ambassador of Angola for Portugal Luis de Almeida, whose wife is also German… What I want to say is that cooperation between the National Liberation Movements and Germany at that point of time was already a reality. With independence, as you know, there were two Germanys: Federal and Democratic. And I must say that our government had the great sensibility of having an Embassy in both countries. We had an Embassy in Berlin, with H. E. Amb. Mendes-Carvalho, and also in Bonn. What I want to say is that we found that such a division between countries deserved respect and both merited diplomatic relations. And when Germany reunited, we moved everything to Berlin to start a new era in our mutual relations aimed at expanding the ties. Before the unification, thousands of Angolans had already travelled to the RDA to receive technical or superior education. We have a lot of examples, even here in our Embassy we have employees that studied here in Germany. So, in educating our elites, we received a lot of help from Germany. And also in other activities that we are also trying to expand. How do you evaluate relations between the two countries? 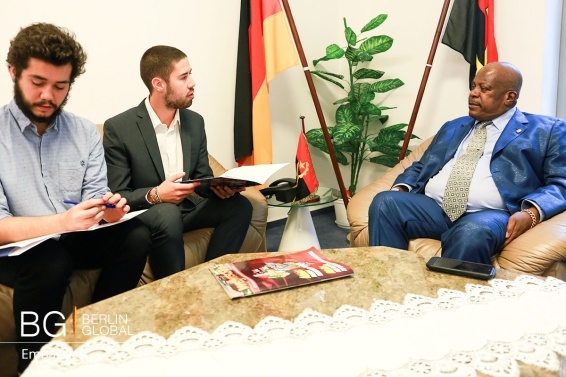 What does Your Excellency consider to be the most important issues of cooperation between Angola and Germany and in which areas do you think there is space for improvement? As you know, we are currently living a world-spread crisis. It is affecting all the countries in the world, including Angola. The crisis is mostly felt in our countries, considered as poorly developed or emerging. It’s not as hard in Germany. As you know, Germany is right now the biggest economy in Europe. It’s the power that’s leading the EU. We think that, because of this, we look at Germany as our first strategic interest, in the bilateral cooperation level. Angola considers Germany to be the main strategic goal in Europe, with which we must cooperate. And we are making efforts. Aside from the aspects I’ve already cited, such as medicine or energy, there are other areas where we consider cooperation as most important. For example, in elite formation. The German educative model, both in the technical as in the professional level, is really good. We have the experience of many Angolans that have received an education here in Germany, we even have current Ministers that have been educated here. That experience is really good. What I mean to say, other than energy or medicine, education is really important. Other than this, there are other areas. For example, mining. One of the biggest mining companies- I don’t know what the name of KRUPP is now – is one of the biggest companies extracting iron, for example. We have great mines of iron, but not only. Along with iron, we have cobalt, magnesium, uranium. And Germans have a great deal of experience in this. They can help us greatly, in a sense where they can help us relaunch our economy thanks to diversification, which would benefit both countries economically. How would you define Cultural Diplomacy, and what does it mean to you? How can we use cultural diplomacy to strengthen the relations between Angola and Germany? Culture is a determinate element on the diplomatic level. Because good diplomacy is only possible when different countries culturally know each other. And a way of making a population feel that we like them and we would like to cooperate with them is by manifesting our cultural characteristics. Angola has a vast culture, product of their geographical roots and evolution. Germany has a great cultural space too, product of its European evolution. Relations between Africans and Germans are positive. One of the few European countries that didn’t have a major influence on the colonialism era was Germany. They don’t have a lot of experience in colonialism because they lost all their (minor) colonies after the First World War. They don’t have the experience of France, England or Portugal in terms of colonialism, in the relation between colonised and colonisers. That’s what causes a more open and trustworthy cultural relationship. We feel that the cultural values of Germany go perfectly well with those of Angola. We think that we have to increment the cultural relations between Germany and Angola, be it in the musical domain, or in arts, theatre… Germany needs to know Angola culturally and Angola needs to know Germany. Angola is a member of the OPEC, African Union, the Community of Portuguese Language Countries and the Latin Union. What is its role in this organization? Do you see your country as bridge between the African and the Latin Culture? If so, in what way? We think that the CPLP is an organization that unites all countries colonized by the Portuguese. Such as the Commonwealth of the British Empire or the French Alliance, the CPLP works in a similar way, but has other goals as well. A bit of, not interdependence, but correlation between the members. Regarding the OPEC, it has different goals. In this moment, with the crisis in Brazil, these organizations are having some problems. Theoretically, in September, the CPLP is supposed to have a meeting in Brazil, but regarding the actual crisis in Brazil, we still don’t know if it’s going to take place. But that doesn’t deny the importance this organization has for the countries that, in one way or the other, depended on Portuguese colonialism. Your whole career is dedicated to politics, and lately you have dedicated yourself to the diplomatic world; with that experience in mind, what advice would you give to young people? It’s not easy to give advice to the youth in such a situation, where there is a widespread world crisis. From an economical point of view, the world is in a crisis, and not a small one. From another point of view, there have been new conflicts between the West and the East since the end of the Cold War. No one could imagine that there will be suicide-terrorists. People who kill themselves in order to kill innocent people in the name of God. Terrorism is the most important problem. I’m seeing thousands of youngsters being mobilised for terrorist actions against other young people. Even today I don’t understand why men have to kill himself and others for inexplicable reasons. It’s true that there were kamikazes in the WWII, but they never had such a widespread popularity. The current kamikazes or terrorists are youngsters, between 17 and 35 years old. And my advice to the youth is that they should have the capacity to make better judgements about the evolution of the world. The way they’re going, they’re going nowhere. You can be sure.